Now that time has come for you to relocate to another state, you are highly thrilled. You call all your neighbours, pals, and members of your extended family for a farewell party. However, the stress comes with the moving itself. You are perplexed, and you do not know who to call. You start searching many keywords over the internet, but your impulses cannot find one you can rely on. We have a solution for you– stop browsing and call the most reliable interstate removalist in the city! We know that interstate moving is more complex than local moving, and this is why we take this service with utmost seriousness. When you call us for this service, we shall first hold an assessment meeting with you so that we can go over service choices, protection, and packing to develop a moving bundle that is specifically made for you. 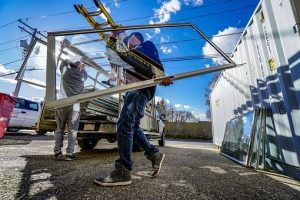 We have a group of expert moving estimators who will come to your home and evaluate the number of your valuables and provide a totally free, no-obligation quote that is customized to suit your needs and budget. Being transparent is something that has offered us a strong reputation that is difficult to beat. When we give the quote to you, we ensure it is well explained in basic language, so that you can quickly know what you are paying for. This differs from a few of our rivals who will give you an estimate that is too great to be true, and later charge you an expensive amount that has concealed charges and ghost services. Whenever you find an interstate mover you feel you can work with, the first thing you must do is make sure he provides you with proof that he has fulfilled all the licensing requirements set by the law of various states. Not many movers will satisfy this requirement, and this is what makes us an industry leader. We have all the licenses needed by various authorities across Australia; for this reason, you can believe in us and feel comfortable when we are moving your treasurable possessions, with the knowledge that you are dealing with a legit professio0nal acknowledged by the law. Moving your car to another state is a challenging task but we make it super-easy and affordable just for you! We understand that it can take some time for you to settle in a new state. Therefore, we provide safe storage for all your goods. When the ideal time comes, you shall alert us and we will bring them right to your doorstep. Make your interstate moving easy and economical with the most respectable removalist in the country. Hit the call button and speak with us about your needs today.